I'm always on a look-out for simple but rave-worthy recipes. Although I love cooking, I don't fancy slaving away in the kitchen all day. I also believe in shortcuts to make my life easier. These days, entertaining a family or two in my apartment is easy. I stick to crowd pleasing recipes which doesn't require much preparation nor use every pot and pan in the kitchen. I found this recipe in Silver Spoon, one of the best Italian cookbooks there is. Hubby found the book at a charity shop for only £5. 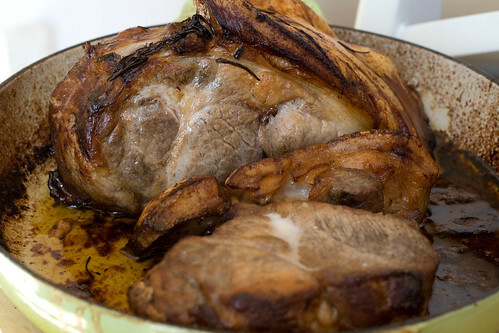 If I wanted to sound fancy, I'd say Arista Al Forno or otherwise known as Roast Loin of Pork. The last time I made the dish, Little L and her friends licked their plates clean which itself is a high compliment indeed. My friend and hubby raved about the dish for days. I replaced the white wine with dry sherry as it was the only alcoholic drink I've got in the kitchen and it was perfectly fine. I love rosemary and threw in 3-4 sprigs instead of 1. Instead of cannellini beans, I've served the pork with fried potatoes. Basically, cut potatoes (I prefer Queen Charlotte) into small cubes, and fry with a knob of butter and season with sea salt, freshly ground black pepper and thyme (if you have some). 1. Preheat the oven to 180 C/350 F/Gas Mark 4. Heat the butter, oil and rosemary in an oval roasting tin, add pork and cook, turning frequently for 5-10 minutes until browned all over. 2. Add the wine and cook until it was evaporated, then season with salt and pepper. 3. Transfer to the oven and roast, turning occasionally and basting with hot milk for 1 hour or until cooked through. 4. 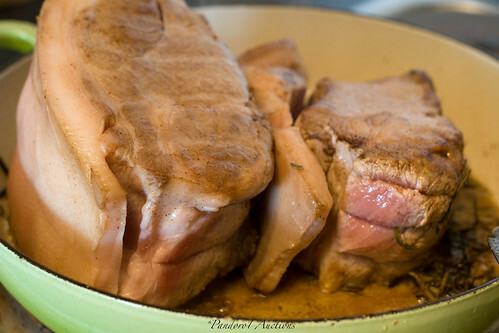 Remove the pork from oven and leave to stand for 10 minutes, then carve. Serve with a side dish of boiled Tuscan or cannellini beans seasoned with extra virgin olive oil, salt and pepper. Must make this. Looks so easy! it's so easy to make. And you only need to clean one casserole dish/roasting tin. Looks yummy !! Must try this when I have enough people to eat . Mi, I think a kg of pork can easily feed you, Di, Carol and the kids. I'll be surprised if there's any leftovers.